Measurements: 2.6 x 4.7 inches, or 66 x 120 mm. Back of card: As is customary in Lo Scarabeo decks, based on one of the cards in it, in this case, the Lovers card (shown above), which is printed in quadruplicate (reflected left/right, up/down) in a rich purple. May be inverted. Book included: Yes, 156 pages, 5.9 x 8.3 inches, or 15 x 21 cm. B&W illustrations. 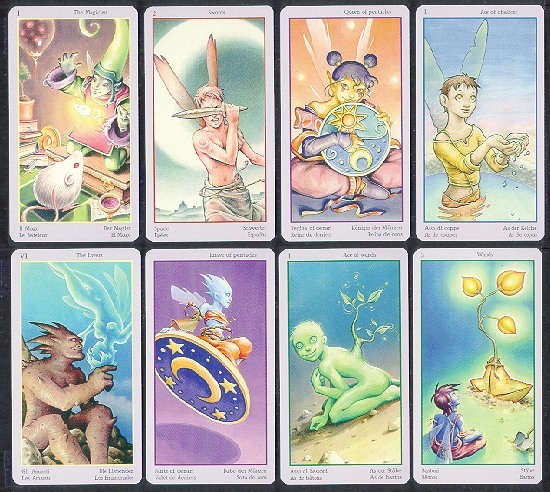 Major arcana cards get two pages each, minors get one each. Publisher: Lo Scarabeo. The box says "Printed in the EU", but it's likely to be the usual suspects in Torino. Comments: From the back of the book, it says, The Fey Tarot is an enchanting deck: full of life & energy. Just like fairies, it contains no shadows - or only those that we ourselves bring - and no evil, violence or maliciousness. The cards are interwoven with dreams that soar above daily routine; with Joy that allows us to come through storms & tempests without losing our way; and with Magic, the vital breath of every Fey.... The heart of the Fey is linked to that of a child. It is as sweet & delicate as the dew, as well as simple & kind - yet it is also ancient, noble & courageous: in tune with the magic of the entire world. The first few pages of the book are quite wonderful. In the Introduction, Minetti writes of the artist's struggle to get the images just right & illustrates his points with various preliminary sketches as well a final sketches (which were later used to create the color images). It is both fascinating, and highly educational, to see how decks are created, the challenges, the struggles, the compromises, the inspirations. Author Ricardo Minetti is the head of Lo Scarabeo. Aside from publishing tarot decks, this is not the first tarot deck he himself has helped create. The opinion of a man in his position matters more than most. The Sentence which sums up the card, often in cryptic form so as not to trivialize the meaning. The Image, or description of the card itself. Simple Meaning: key words & phrases for beginners. The Chosen Symbols: What the individual parts of the card mean. A similar organization is used for the number cards: Image, Simple Meaning, Advanced Meaning, Symbols Used. For court cards, Personality, Image, Simple Meaning, Advanced Meaning. All in all, an excellent book.